It's been a while since I worked on any terrain. I usually travel for gaming, and my gaming pals have way nicer terrain sets then I do. However, having some friends over for games over the last few weeks has made me look at my own set again. 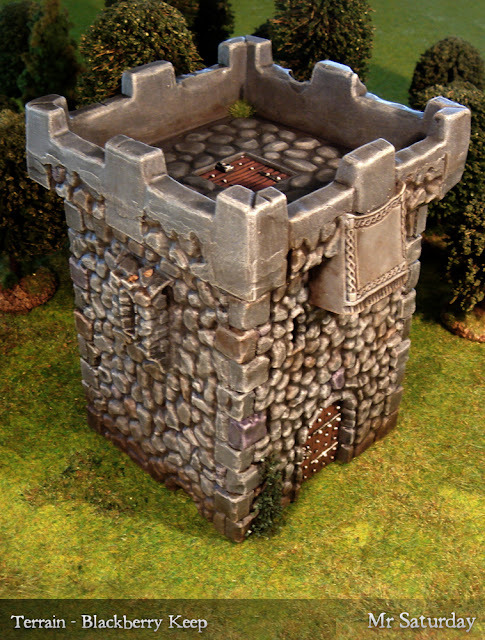 This old Battle Masters tower has been sat in a wardrobe half finished for years. Every time I opened said wardrobe I would see it and resolve to paint it soon. Years pass. Game systems rose and fell and still the tower lay unfinished. This particular time when I looked up at it I just took at down and put it on my painting desk. Two sessions later, done. 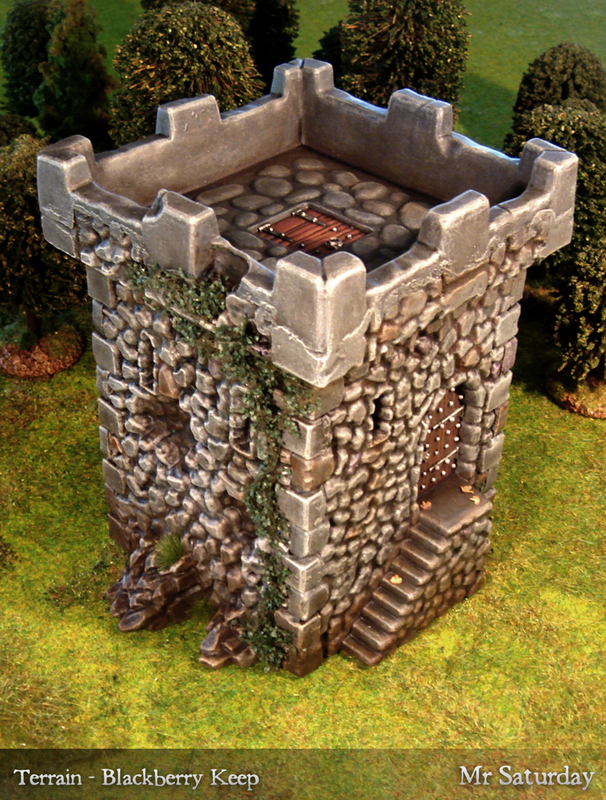 I no longer have that particular mind-worm nibbling at me, and I get a new big terrain piece. Decisiveness, that's the ticket! There is some slightly ropey milliput work I did on it back in the day, but not so much that I felt the need to spend hours fixing it. It adds to the tumbledown charm. YES IT DOES. Typhus Corrosion once again did it's magic on the weathering. Is there nothing that can't be made look better with a dab of this magical sauce? I'm trying to tart up my gaming mats at the moment too, which suffer a bit from bowling green-itis. You can see my efforts here. I've added watered down washes, more types of flock and some torn up grass matting all bedded down with pva glue. A little basing scatter here and there and it's getting there. The first mat look a while to get to a point where I was happy, and I still need to work the edges a little, but it's looking like I'll then have a process for upgrading the other mats. Recently I discovered a cache of undead Bob Olley goodness was available from Essex Miniatures. If you are an Olley fan do yourself a favour and take a look. 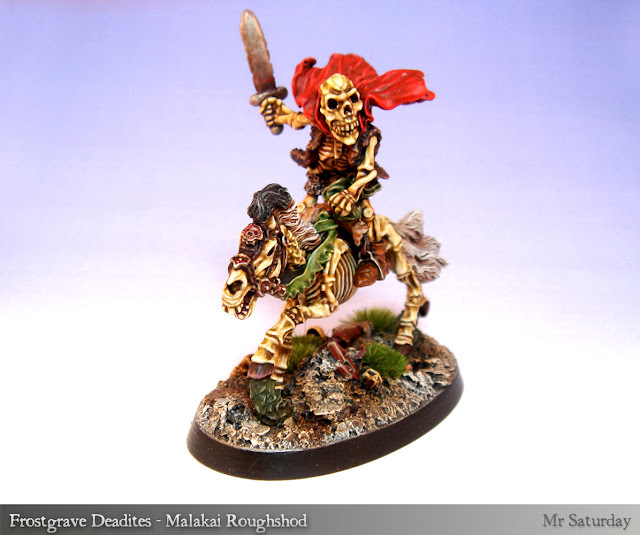 Soon after I saw on the Oldhammer Facebook page that the excellent Stuart Klatcheff was offering some of these fine miniatures to anyone offering to paint and post them within the month. Well, what's a guy to do? I obviously picked the biggest one, the cavalry model. He's as fine an example of Olleyness as I've ever seen, enough folds and textures for a man to get lost in. I present the latest addition to my deadites, Malakai Roughshod. It's hard to find a golden angle on this fellow, so I've taken a few shots of him. He's pretty dynamic, standing in the saddle with his cloak billowing. I managed to drill right through his saddle TWICE while adding a pinning hole, once after he was painted. I may have said a few bad words. 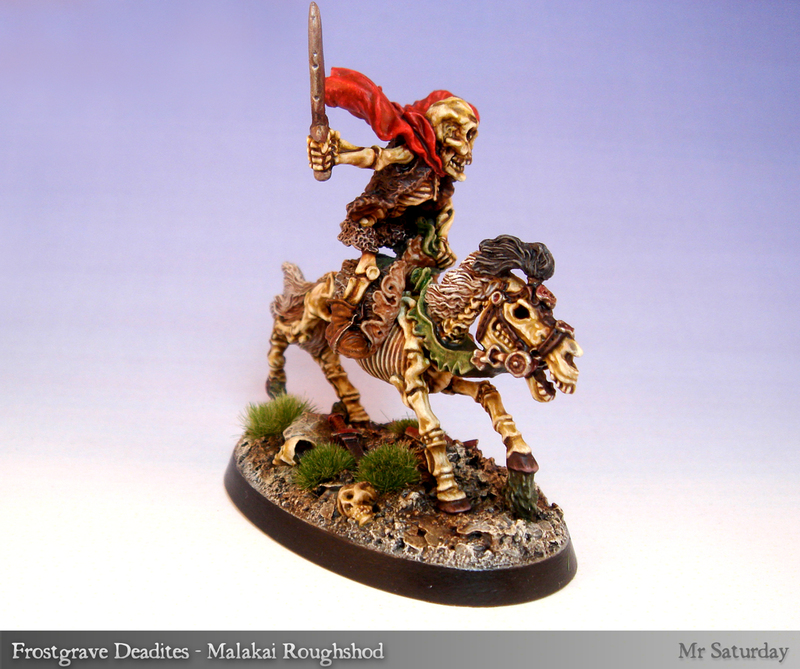 He's also pretty huge, lording it over even other Skellybobs (Skeletons sculpted by Bob). I'm kind of in love with this guy. 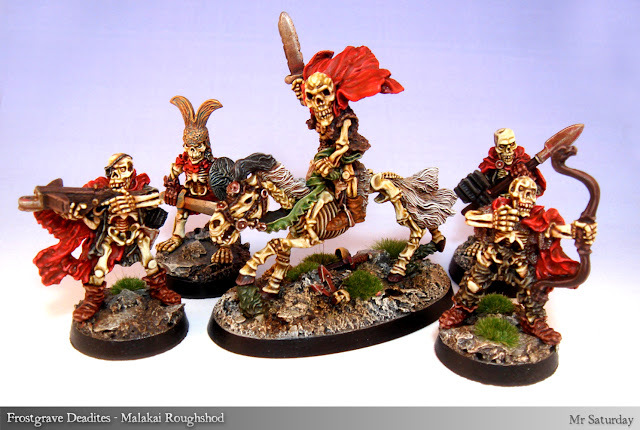 I'm now debating adding a few of his mates so I can field a unit of these lads in Dragon Rampant or Age of Sigmar. Here's Malakai chilling with his new homies. See what I mean about huge? Look at the size of that skull!